Congratulations on making it to Day 14 of Bucky Is Back. 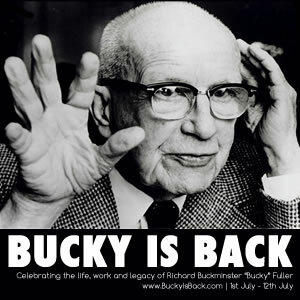 We hope you have enjoyed the inquiry, discovery and adventure into the life, times, work and legacy of Bucky. We recommend you now consider how to move towards an Optimal World and register at www.beTHEvortex.com to learn what’s possible now, and how people who have been inspired by Bucky and others are now coming together to collaborate and create. This is your invitation and reward for having inquired into the life, times, work and legacy of Bucky and in so doing have increased your integrity and creativity.